Learning to play any musical instrument is quite a challenge, which will require a huge amount of patience and perseverance. It is better, first of all, to get acquainted at least casually with a musical note, but not all instruments require its knowledge. For example, learning guitar, offers an alternative, simple option – tablature. However, in the case of the piano, things are somewhat more complicated. Suppose that the musical notation has already been studied, or at least some idea of ​​it, you have. But the trouble is, the hands do not listen at all and it’s not clear what the matter is, whether the brain is not able to control its actions, or something else. This is one of the most common problems encountered by beginning musicians engaged in self-study. The confusion in the fingers can be easily avoided if one learns their numbering and correct position. Initially, it is difficult to understand for which notes, each specific finger responds. An excellent option for the game, will be children’s songs, notes in which, most often, and have an indication of the required finger. Gradually raising its level, the correct position will become a habit and hands, will cease to be “hooks”. This is only the first small step to mastering such a complex instrument as a piano. Experienced teacher, constantly draws attention to the student’s landing, correcting or correcting it. First of all, the height is important. If the position is incorrectly chosen, the hands of the musician can be overextended, which will entail a number of complex problems, ranging from simple edemas and ending with serious diseases. Installation of the chair is made strictly in the middle of the instrument. The standard piano has 8-9 acts, when placing the seat in the center, the first octave will be directly in front of the pupil. However, the creators of this wonderful tool made an excellent hint. The position of the chair must be strictly opposite to the two pedals, so that access to them is not hampered. If everything is done correctly, then the musician will be able to cover the whole range of sounds that can be squeezed out of the piano. The next most important point concerns the correct placement of hands over the keys. Unlike playing the guitar, where the brush is primarily used (the mediator is a variable stroke), the piano requires the owner to work the entire hand from the shoulder to the fingers. A good teacher knows how easy and simple to draw an analogy between the correct work of the hand and the droplet. It should be imagined that the water begins to drain from the shoulder and to the fingers. In this case, the hand must take a falling position. It is important to note that with direct play, both hands perform the same functions. This somewhat simplifies the whole process, because on the same violin, one needs to work properly with the bow, and the other set notes. Performing different actions is always somewhat more difficult than the same. Some synchronism of movements must be present, otherwise the game will not look easy. 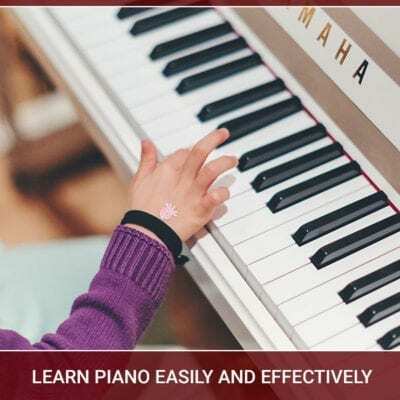 Do not start learning to play the piano using complex works that at this stage will not be available. An excellent beginning is a gamble game, any understanding person will tell you about it. With them, the training begins on most musical instruments, including the piano. This will not only tame your hands, but also memorize notes. Simple melodies are recommended from works. Children’s songbooks will be an ideal option for a start. If you have any problems with your hands or musical notes, it is better to contact a professional teacher. Do not neglect this opportunity, because a good teacher not only teaches the basics, but also tells about some tricks in the further comprehension of a complex variety of keyboard instruments.